Email is the preferred method of contact so that we adequately understand and address all of your questions and concerns. A new application of existing science and technology designed to improve power quality in home and office environments. The EMF FILTERS filter is based upon 100 year-old science and power engineering principles. Newly introduced is the design, which is focused on the needs of the customers in homes, offices, schools, etc. Filters have been extensively applied for decades by industrial users and the electric utility industry itself. The EMF FILTERS filter is designed to filter harmonics and other high frequency current (trash) from the electrical environment, thereby reducing the potential for leakage into the human environment and creating additional trash in non-liner loads (televisions, computers, variable frequency drives, energy-efficient lighting, etc.). The high frequency current (trash) on the neutral wire in the electrical system is positioned to return directly to the power system via the feeder neutral to the substation, and possibly beyond. However, as is often the case, the utility feeder neutral is not adequately sized (as required by the Public Service Commission of Wisconsin). If this is the case, much of the return current will flow through the ground rather than the feeder neutral. Under these conditions, the EMF FILTERS filters still provide benefits; this should be seen as local mitigation rather than part of a complete solution that requires an adequately sized neutral return. At 60 Hz the filters act as capacitors and normally marginally improve the power factor of the customer load, which are normally slightly inductive. Filters are designed to be installed throughout the home in a pattern that corresponds to the distributed nature of the need. For example, installing two filters close to a desktop computer or a television is normally appropriate and effective. Installing filters, normally from two to six, close to the input power panel is recommended to address high frequency currents entering on the power lines. The total number of filters required depends on the size of the home, the amount of electrical equipment, and the quality of the power from the grid. Twenty filters are normally adequate for a “typical” house. Installing an inadequate number of filters tends to result in overloaded filters, leading to an ineffective solution. The preferred installation method is to be guided by the EMF Microsurge Meter, which measures the amount of high frequency energy present. Readings of 30 or lower indicate an acceptable environment, while readings of 50 or higher indicate a need for additional filters. Readings between 30 and 50 are marginally acceptable, but should be reduced if anyone in the area is electrically sensitive. Email is the preferred means of contact so that we properly understand and address your questions. EMF FILTERS are very easy to install on your own. Follow these instructions to maximize filter effectiveness. Note: Many homes may not have enough open outlets to install the number of filters needed to clean up the home. If this is the case, purchase several power strips, plug your electronic devices into them, and install filters in the power strips as per the instructions below. One filter should be installed in an outlet on each wall of the rooms you spend the most time in, especially bedrooms. Other rooms where this should be done may include your living room, kitchen, den, etc. Two phases of current are used to supply utility power to your home: A phase and B phase. One filter should be installed in an outlet on each phase of current as close as possible to the main electrical panel in your home. Most homes will have one electrical outlet dropped down directly from the main panel; installing a filer in this outlet will take care of one current phase. For maximum effectiveness, call your local electrician and have him or her drop another outlet down from the panel on the other phase, then install a filter in that outlet as well. When these directions are followed, a sufficient number of EMF FILTERS should be installed to effectively clean up the average home. WE HAVE BEEN A LEADER IN EMF METER SALES! 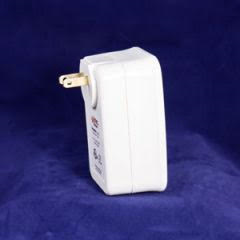 Once you get your EMF Metering Device (Stetzerizer Meter) from us, then plug it in to your wall. If your reading is 80 or higher, then you could be in danger, GRAVE DANGER! Our filters can reduce these harmful levels. We are the price leader on filters as well. You can purchase as many filters as you like from this site for only $28 each! Get them NOW! As indicated in U.S. Government testing and reports measures of electricity above 80 Graham-Stetzer units in an office, home, or work space can be hazardous to animals, people, and the environment. Many of these stray current issues come from the power surges in your power grid, wall outlets, and electrical devices. Our purpose designed filters can help remediate this problem. It is simple really. Get the meter, test your area. Once the reading comes in, then use the filters to remediate the problem. You can use the meter to test the area before and after the filters. You can and will likely “feel” a difference, with fewer headaches, body pains, better sleep, etc. We have much information on this. We can choke a person in data, but what really needs to happen is you need to purchase filters and plug them in as you continue your efforts to lower the EMF effects of power surging through your body and work space. Buy filters now at the lowest price online. We are allowing folks to become affiiates in this business. This could provide UNLIMITED Income Opportunity helping people avoid sickness! See our store for products and details. Availability varies. See many of our EMF Protection products at the online store. Demand is high. In our modern world we have become entirely too dependent on WIFI, hotspots, and electrically stimulated devices. These devices and the electromagnetic fields produced by them and by the systems that drive them cause abnormal issues in our world. Many of these have not been fully explained nor understood. Watch what happens…………. Electromagnetic Frequencies cause sickness and even cancers. It is critical for people to see that “opposites attract” and “like or similar charges oppose”. When cyclical electromagnetic pulses go through your walls, wires, and devices the signal that is sent out oscillates at 60 hertz (60 cycles per second). Every “positive” charged part of the surge draws in or attracts the negative ions in your body. Every negative surge repels. Now look at this action of attraction and rejection occurring in your body at 60 cycles per second (60 Hertz). This redirects electrical stimuli within the body causing or agitating a host of sickness issues. For this reason we need EMF Protection. EMF Protection comes in many forms. There are “shields” for electromagnetic radiation protection, and there are filters. Electromagnetic or EMF filters are available in several forms, yet they all are built on the foundational development and designs of our systems. Our developers for Electromagnetic protection and Electromagnetic protection devices developed this science and the industry itself. Our interest in EMF Filters, EMF Protection, and EMF devices stems in part from our ground breaking approaches to Holistic Cancer Treatment as outlined in our book, THE ANSWER TO CANCER: A SIMPLE SOLUTION TO THE WESTERN CONDITION. Products and books in this regard are being made available through our online book store. The recommended EMF Filters on our site are primarily of the Stetzer-Graham joint venture efforts. The EMF Protection provided by these devices are readily measurable both mechanically using meters available through our web store. Many of the effects can be eliminated with the Stetzerizer filters available from our online store. EMF Radiation protection is critical for those seeking good health. No matter what approach or approaches you use, if you do not resolve the oscillating current effects mentioned above, then you will have the effects of a system out of alignment. We are here to help. Our goals are healing the body of pain and sickness. Our holistic books and approaches are producing astounding results for those who are serious about solving their issues. Our filter/meter products effectively reduce and/or eliminate EMF issues in your external environment. Our health approaches outlined in our books resolve EMF issues internal to the body. The combination is win-win-win. In many instances pain and sickness leave the body by employing some simple methods. We are so convinced that the combined approach will be universally successful that we are including a copy of our book in each and every order. EMF Protection Reviews and EMF Protection Devices Reviews the world over recognize the Stetzerizer and Stetzer filters, meters and products. The use of these and other by way of comparison in EMF protection reviews has the Stetzerizer products continually coming in at the top rating(s). When combined with effective Electromagnetic Shielding and awareness approaches the results are immediate and astounding. We encourage you to dig into the information provided in the links below regarding EMF/Electromagnetic testing, research and remediation. Dirty Electricity is often driven by fluxuations in voltage/amperage in the lines and components within our homes. This stray current can be “filtered” using patented processes and components. We are pleased to represent the top producers in EMF reconciliation hardware. EMF waves have been determined by U.S. Naval studies to cause sickness, cancers, and a host of problems. EMF exists in every home in America due to computers, electronics, fluorescent lights, and a host of electronic gadgets. We have a “plan” and a means to “test” the home/office, and two separate means to reconcile the environment. We have one plan (a book/information) for reconciling the internal human body. We have a product (filters/shock absorbers) that address the external environment including your office, bed room, home, etc.